The 2018 Mythic Dungeon Invitational (MDI) Regional Group Stage play kicked off on April 13 in China, pitting the top eight performing teams from each region in a best-of-three, double-elimination bracket. In this season’s MDI, each round begins with a predetermined map and set of affixes, with an increase in key level, and difficulty, as the tournament progresses. The losing team chooses subsequent maps and one of the three affixes. The winner of the regional event (for China, Asia-Pacific, North America and Europe) takes home $6000, and the top two teams move forward to the live global championship event in Ohio this June. The most stunning performance came from Skyline.D. The top-seeded team for the region remained undefeated throughout the entire tournament with their consistent, often flawless, execution of mechanics in each dungeon presented to them. They ended the day with 16 deaths across eight matches. Of those deaths, half came during their first foray into Seat of the Triumvirate, in a match with their sister team, Skyline.Top. 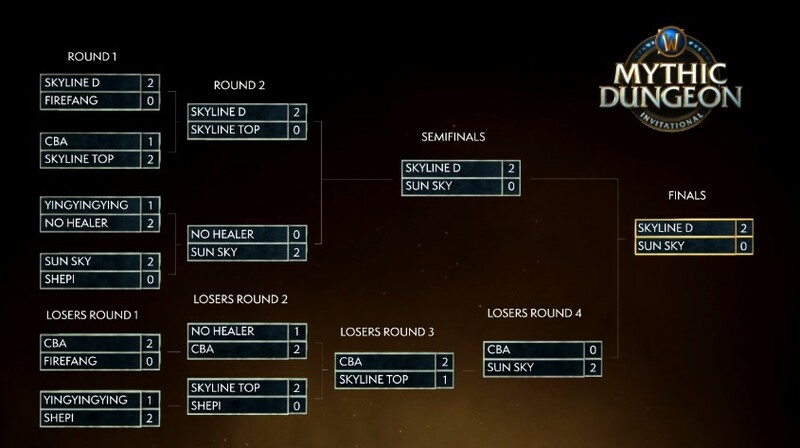 Their second run through Seat was against Sun Sky, and Skyline.D finished with only two deaths, proving they learned from their previous mistakes. During the MDI Time Trials leading up to the regional events, we saw some unorthodox team compositions—sometimes omitting a healer, or even stacking Windwalker Monks or Demon Hunters—to achieve the best combined time to qualify and determine seeding for the regional event. During the China tournament, however, teams leaned toward more traditional team compositions since they did not have the luxury of resetting if the run went horribly wrong. The aptly named No Healer powered through the first round, but their strategy started to break down when they failed to take the first game in subsequent series against CBA, and finalists Sun Sky. Two themes rang throughout the tournament—clever use of game mechanics and the kill-only-what-you-absolutely-have-to technique—creating make-or-break moments for several teams. The most impressive use of class abilities came from teams Sun Sky and CBA during Black Rook Hold. To start their run, Sun Sky’s Death Knight cast Control Undead on the Risen Arcanist, found among trash packs leading up to the second boss, Illysanna Ravencrest, to prevent it from being killed while clearing the rest of the pack. Next, the Death Knight cancelled Control Undead, which allowed the Mage to Spellsteal Arcane Blitz. This build stacked 50% increased damage per application, which empowered the Mage to obliterate problematic trash packs and crush bosses, while carefully babysitting the Arcanist with Control Undead for the remainder of the dungeon. The strategy worked marvelously for Sun Sky in their victory over No Healer, but it wasn’t enough to overcome Skyline.D due to a 40-second death penalty from eight deaths. When it comes to killing what you have to, the Rogue spell Shroud of Concealment is one of the strongest tools for skipping unnecessary trash packs. Its cooldown is nearly half that of Invisibility potions at six minutes, and teams with Rogues can essentially double dip on skip opportunities, allowing them to precisely meet the mob count requirement. An alternative method is using single-player or full-team wipes in conjunction with Failure Detection Pylon, an engineer-made item that acts as a weaker version of in-combat resurrection spells. While an incredible time saver, it can also spell doom for a team who kills too few enemies before reaching the final boss, as CBA learned the hard way by killing Xavius before Sun Sky, but falling 2% short on mob count in Darkheart Thicket. While there were no overwhelming upsets throughout the tournament Skyline.D proved themselves as a force to be reckoned with. Next week at the Asia-Pacific (APAC) regionals we’ll see if returning champions, Free Marsy, will return to the finals and prove to be a roadblock for Skyline.D. The APAC Regionals start on the official Warcraft Twitch channel at 8 p.m. PDT Friday, April 20.